13 Unique Wedding Seating Chart Ideas | Wedding Ideas ARE YOU A VENDOR? 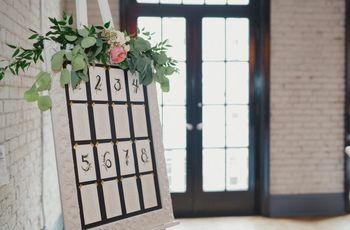 A wedding seating chart is essential for showing your guests where they’ll be spending the majority of your celebration, but it’s also an opportunity to set the tone for your reception and establish your wedding theme and decor style. 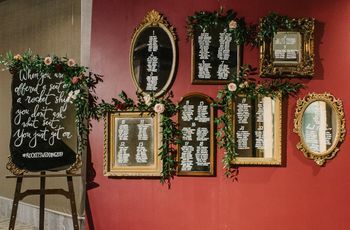 We’ve rounded up a few unique ways of displaying wedding seating charts so that you can create one that fits the theme of your big day perfectly. Feel free to copy these to a tee or use them as inspiration to create something totally your own. Here are a few unique wedding seating chart ideas. 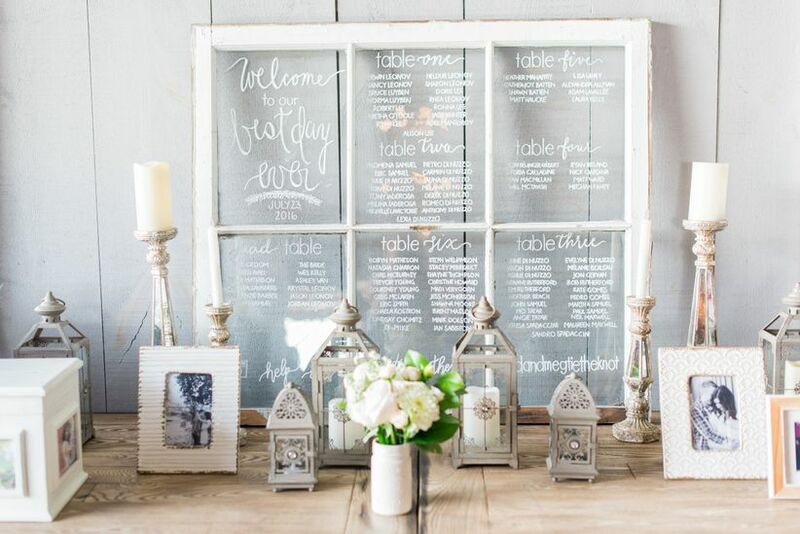 Head to your local antique shop and hunt down a sweet vintage mirror to write your wedding seating chart details on. 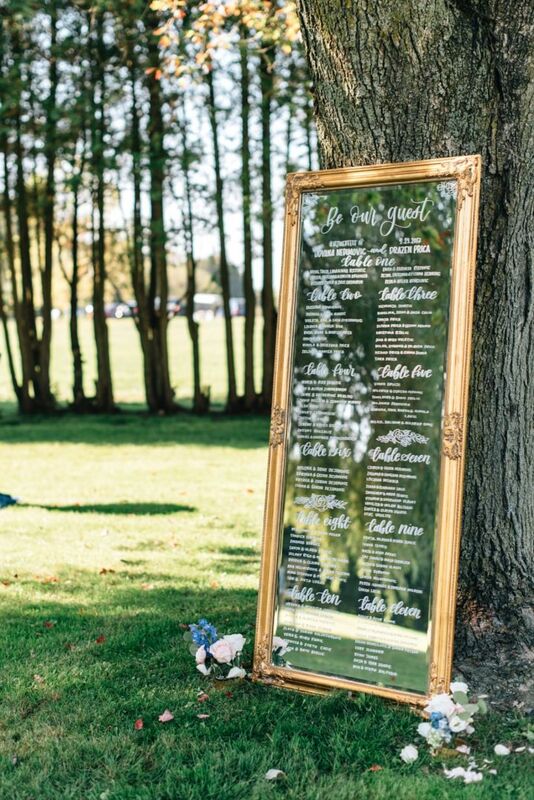 If you go this route, be mindful of what the mirror will be reflecting when you place it at your venue (we love that the mirror pictured below reflects the surrounding foliage). It can totally be used as decor in your home after your wedding has wrapped, so it serves double duty. Pro tip: if you don’t want to spend your time rooting around thrift stores, many rental companies have options on hand, too. In the market for a truly unique wedding seating chart idea? 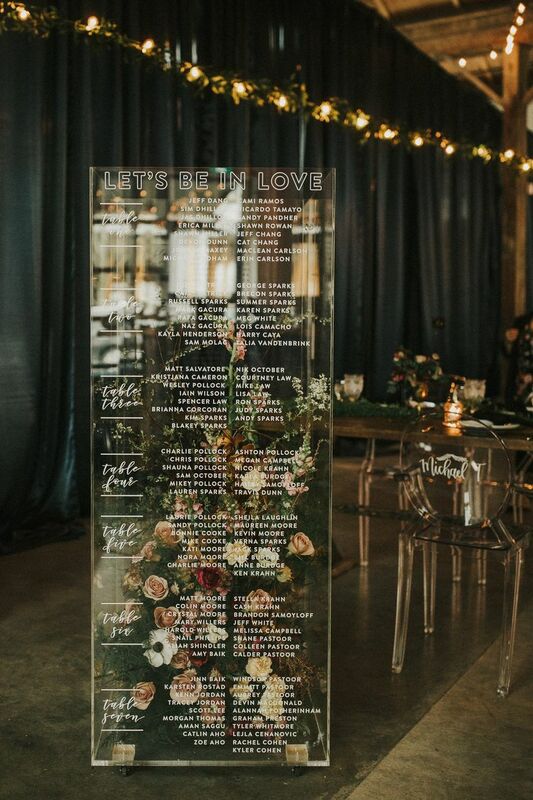 Write your guests’ names on a flower-filled lucite box or pen them onto a pane of glass. The transparent wedding decor trend is super popular ATM, making it an awesome choice for a more modern celebration. 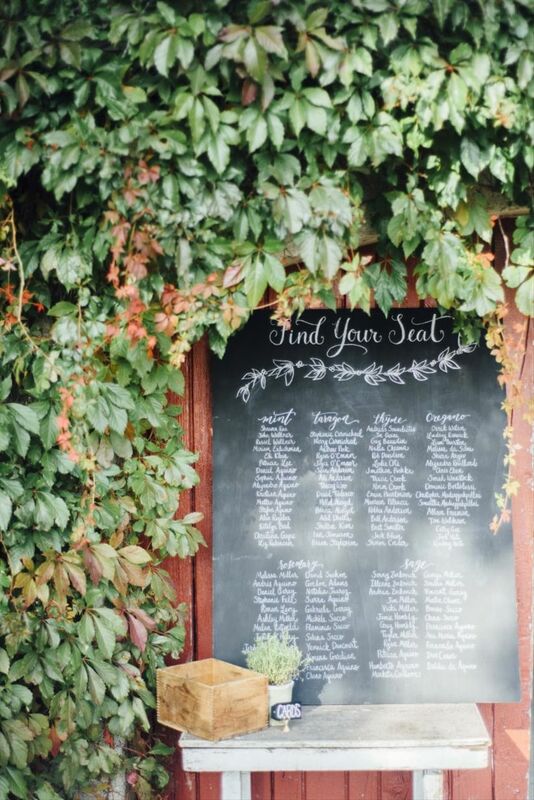 Chalkboards aren’t just for classrooms - they also make for amazing wedding seating charts. 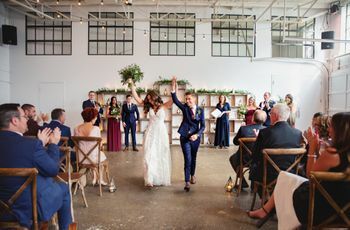 Bonus: if you have to move any of your guests around at the eleventh hour, it’s super easy to make edits on them (all you need is an eraser, a piece of chalk and a steady hand). 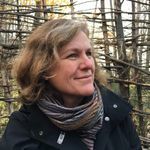 Use a panel of wire mesh as your backdrop and fill it with colourful table cards, florals and greenery to create your own one-of-a-kind installation. 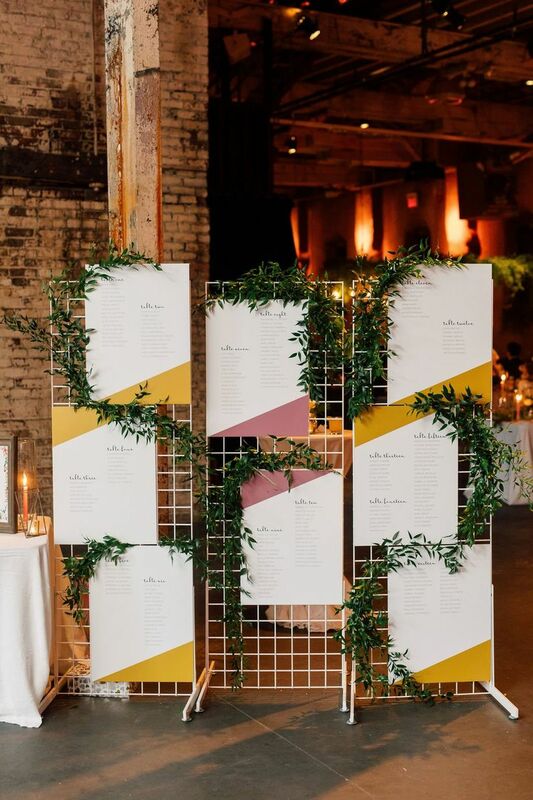 This edgy, modern seating chart style works great for artsy, industrial-chic wedding themes, but can really be used for any reception style with the right props. 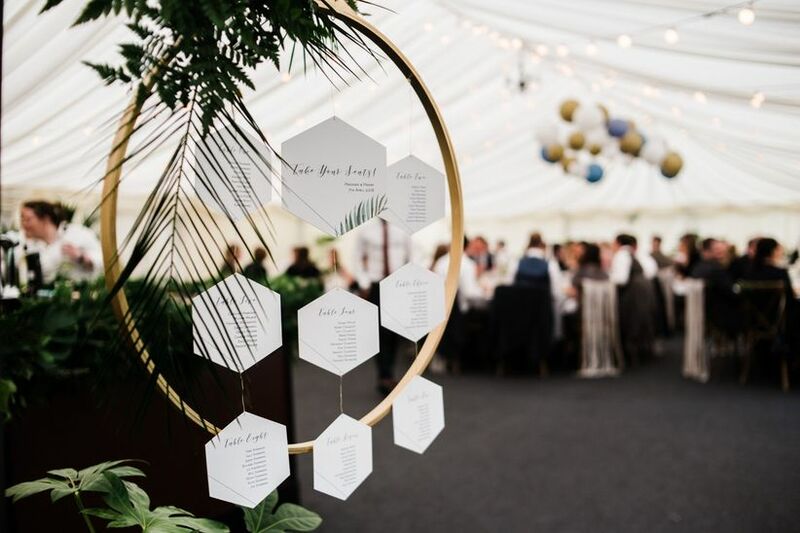 Embrace the geometric wedding decor trend with a hoop seating chart – perfect for modern weddings. We recommend mixing and matching different shapes, textures, and finishes to create something super eye-catching. On the hunt for something with some serious industrial-chic style? This might just be the wedding seating chart design for you. Instead of displaying your chart on an easel, hang it from a metallic frame. If you’re super handy, you can create it yourself with copper pipe and tubing from the hardware store. Hey, travel fans, this one’s for you. 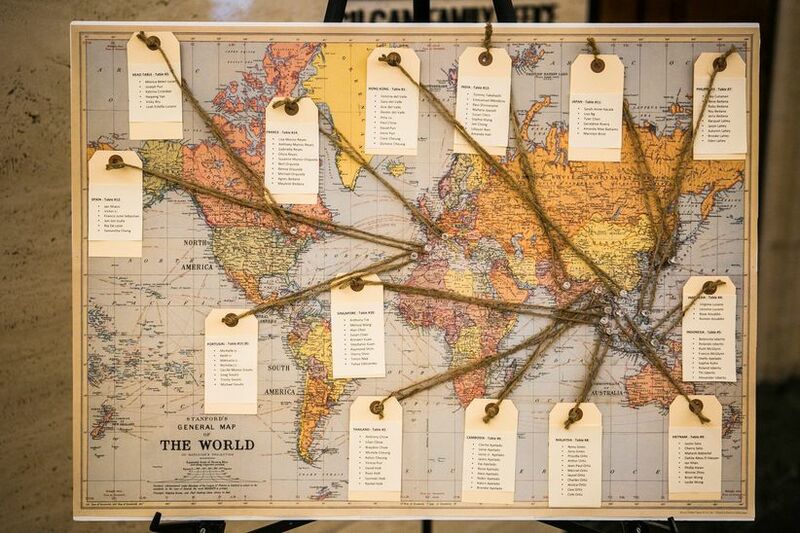 Show off your wanderlust by using a map as the base for your seating chart. P.S. You get bonus points if you name your tables after places you’ve been (or are dying to go to). 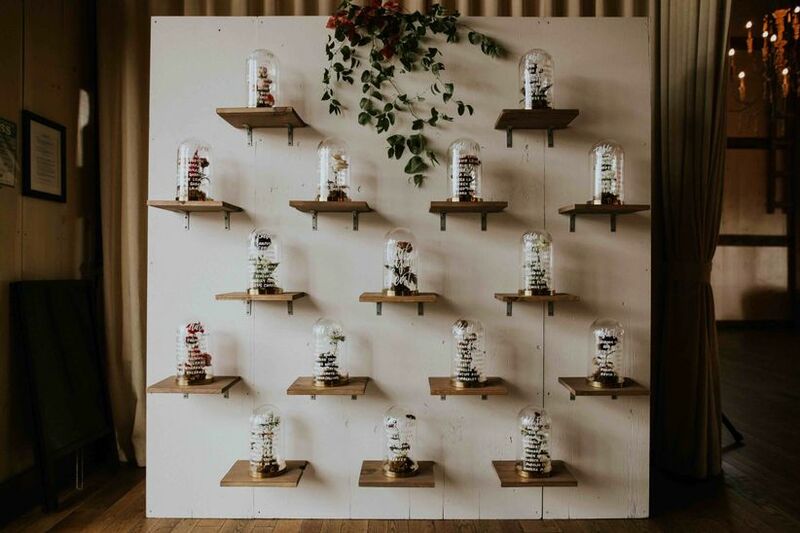 Give your wedding seating chart a whimsical feel by displaying your guests’ names on flower-filled bell jars. This option is ultra-romantic and has a real Beauty and the Beast vibe. 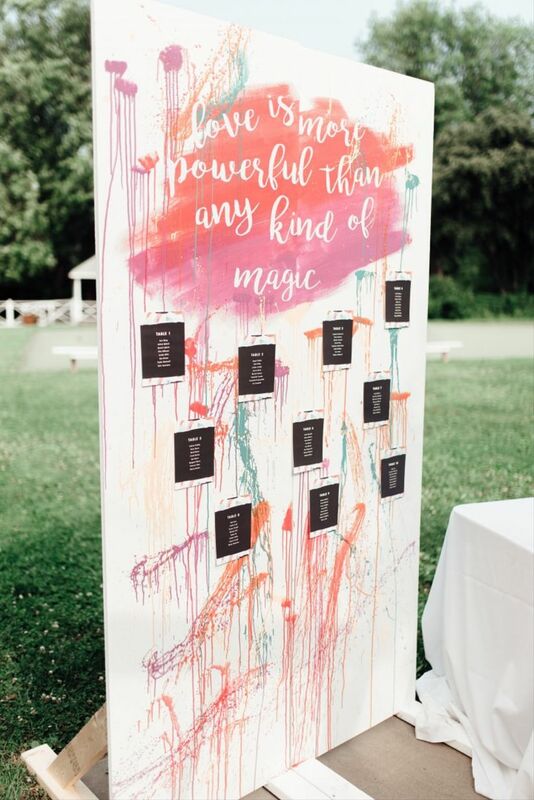 Turn your wedding seating chart into a real work of art by posting your table details on a painted canvas. If you’re super talented with a brush, you can make this yourself, or you can ask a talented friend or pro to take on the project for you. 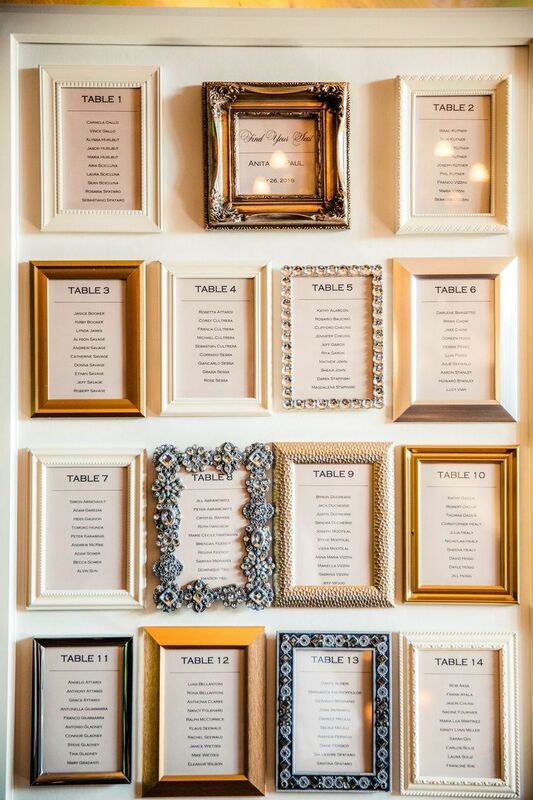 Frames are a tried and true option for wedding seating chart displays and work with just about any theme. For those looking to shake up the traditional design, skip the massive frame and mix and match smaller ones, like this couple, instead. 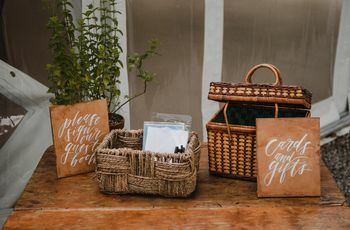 For rustic weddings, crates are basically a decor staple. 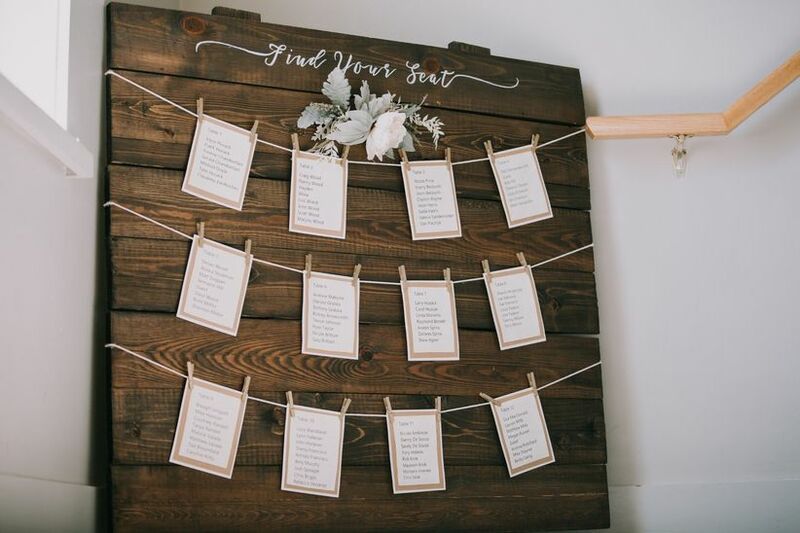 If you’re looking for a creative way to work them into your reception space, use them to display your wedding seating chart. You can go bare bones or paint the crates to match your colour scheme perfectly. 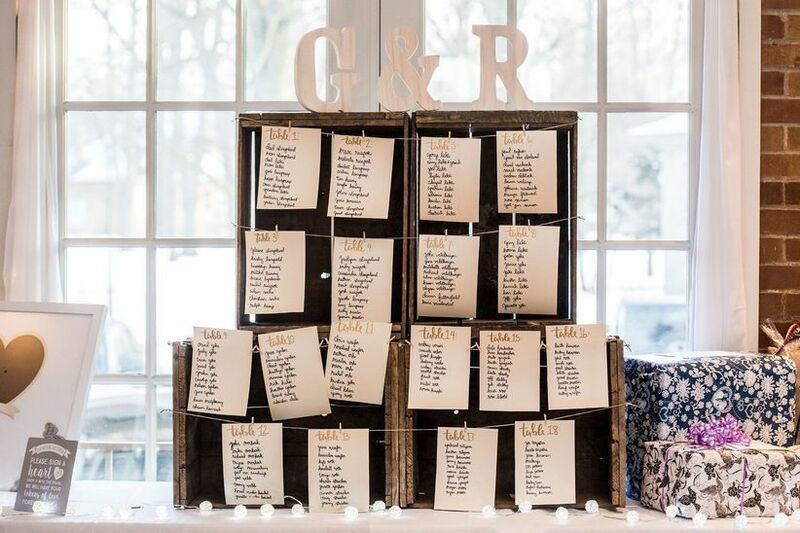 Looking for rustic-chic wedding seating chart idea that’s a little sleeker and more stylish than a crate chart? Use reclaimed wooden planks as your backdrop. 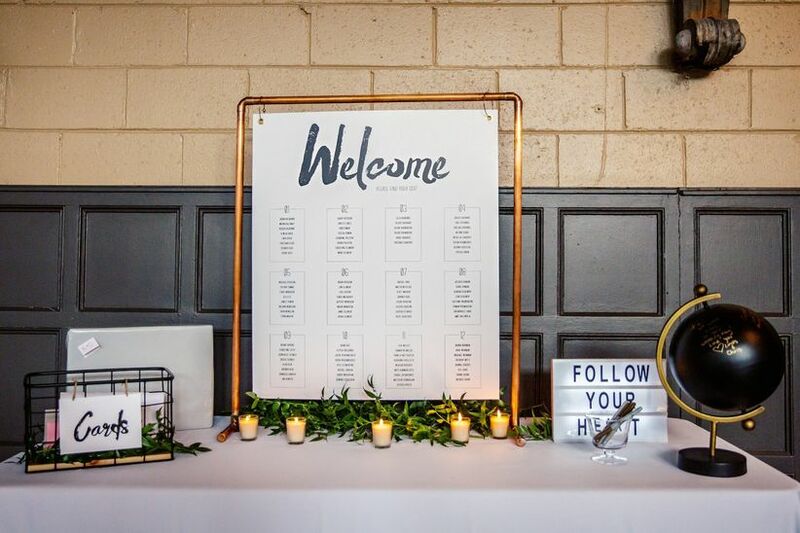 Add a bit of twine, a few blooms and some flowery script and your table map will be 100% wedding-worthy. If you’re looking for a wedding seating chart design that’s really out-of-the-box, this is the one for you. 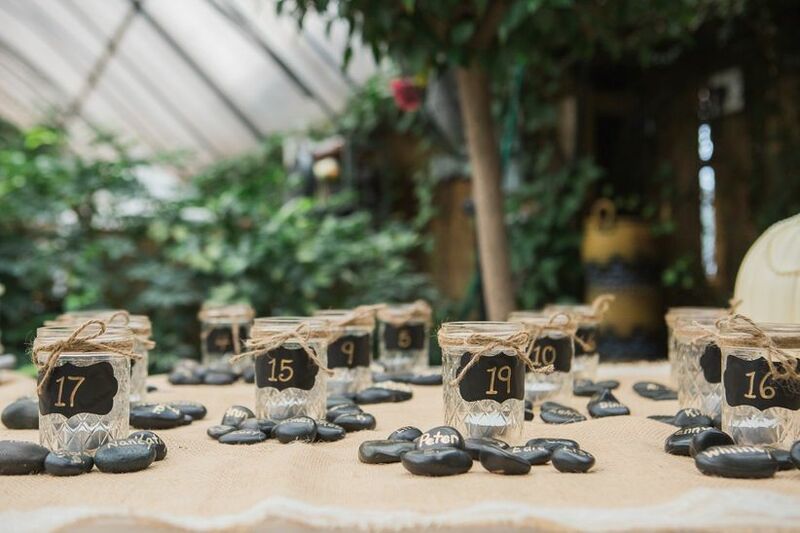 Use jars (or other small vessels) to display your table numbers and surround them with rocks or gems with your guests’ names written on them. This option is super easy to DIY, so you can totally make it yourself.